The annual Renaissance Festival is back and celebrating its 30th season of tomfoolery, feasting, tricks and thrills. The festival village spans 30 acres and is filled with old world revelry. The annual event opens on February 10th and continues for eight weekends – Saturdays, Sundays and Presidents Day – through April 1st. The Festival was introduced in 1989 with nine acres of exhibits, attractions and entertainment. The festival has matured into a thirty-acre theme park. 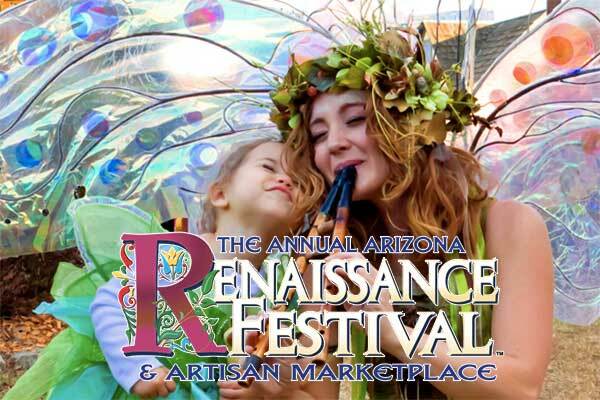 The Arizona Renaissance Festival is one of the largest Renaissance Fairs in the nation. Not even in her wildest dreams would Queen Elizabeth have imagined such an event taking place in the foothills of the Superstition Mountains. The festival is an incredibly interactive event with a variety of amusements and antics that surround you! Patrons can sit back and watch or become part of the action. There are more than 2,000 costumed characters in authentic and elaborate period garments roaming the Festival village for eight weekends of high energy revelry. The village pathways are filled with performers engaging guests in tall tales, acrobatics, song, dance and tomfoolery. To get there, take highway 70 through Globe. Before you get to Apache Junction, you’ll see it on the right. The X symbolizes a kiss because in the Middle Ages is was common to sign one’s name with an X. To seal an agreement, the signer kissed his X. Thus the X came to stand for a kiss. When author Geoffrey Chaucer planned to write his greatest book – The Canterbury Tales – he wanted it to be a travelogue. Women would greet each other with a “French kiss” – which in the days of the Renaissance meant lightly grasping each other’s shoulders and kissing the air on either side of the other women’s cheek three times; never touching due to fear of the plague. King Richard II employed 2,000 cooks and fed 10,000 people every day. The term, “Renaissance Man,” refers to someone who pursues many interllectual and artistic activities. Nutmeg was valued as a spice in vegetable dishes, sweet dishes and mulled drinks alike. East was at the top of all directional maps during the Renaissance. Oil cloth and/or paper was used instead of windows. Most people got married in June because they took their yearly bath in May, and were still smelling pretty good by June, although they were starting to smell; so brides carried a bouquet of flowers to hid the B.O.